Experience Madagascar’s pristine beauty, in the true adventurous spirit. This 11-day journey takes you on an unforgettable kayak trip along the banks of lush mangrove forests, paddling the clear waters in St Luce Reserve’s lakes and walks in the heart of the littoral forests. Allow the abundance of creature sightings, untouched flora of the rainforest, breathtaking blue waters and white beaches to wash your stress away while putting you back in touch with nature. On arrival at Manafiafy Beach you will be rewarded with barefoot luxury, in a private, picturesque bay, surrounded by the very best of Mother Nature, with unlimited activities to unwind, entertain and pamper yourself with. Group size: Minimum (2/4) guests and Maximum 12 guests. This safari is run on scheduled dates throughout the year, but can also be tailor–made to meet your dates, time period and group size. 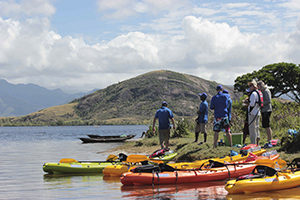 A kayaking adventure to the South East of Madagascar Camping in style and 4* beach lodge accommodation. Camping in absolute style with French-trained chefs catering all meals in St Luce and at Manafiafy, kayaking on the pristine river through the St Luce Reserve, wildlife viewing, bird watching, enjoying the beach at Manafiafy, walks in the rainforest, exploring deserted beaches, whale viewing (June - December) and snorkelling. • 4 nights at Manafiafy Lodge inclusive of activities, meals, local soft drinks and beers. 10 x Breakfast, 8 x Lunch, 10 x Dinner. Please note that for both internal flights and international flights the rates are subject to class, availability and to change. All rates are subject to change according to rate of exchange fluctuations. **Please note there are no trips from 01 September to 19 November. Private departures can be arranged on request. Upon arrival in Antananarivo (Madagascar's capital), you will be met and welcomed by an English speaking guide, before transferring to your hotel in the city centre. 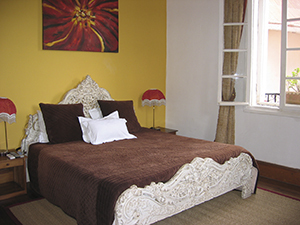 The Pavillion de L'Emyrne has just twelve rooms and is situated in the heart of the old town of Antananarivo. It was originally built as a private residence in the 1930s and is a delightful city guest house with its own garden. Rooms are air-conditioned and have satellite television. Overnight: Pavillion de l'Emyrne, or similar (double room with en-suite bathroom). After breakfast at your hotel, you will be transferred back to Ivato airport for your two hour scheduled flight with Air Madagascar to Fort Dauphin, on the south eastern coast of Madagascar. Upon arrival in Fort Dauphin, transfer by road with lunch at a beach restaurant, then settle into your hotel to spend the remaining day at leisure. Overnight: Kaleta Hotel or similar (Rooms with en-suite bathroom, swimming pool, restaurant and bar). Meals: Breakfast, Lunch and Dinner supplied. Enjoy an early breakfast before we set of on an adventure! Sainte Luce Reserve offers us an experience of the spectacular beauty of south east Madagascar. Your first day of kayaking will be for 4 hours to Evatra, with lunch on the banks of the mangroves and a delightful walk to Lokaro (2,5 hours). Experience beautiful coastal scenery and a gorgeous natural swimming pool nestled in the mountainous coastline. St Luce Reserve is situated on an island-like peninsula, cut off from the mainland by river mouths to the north and south, the reserve has been established to contribute to the conservation of this extraordinary habitat, as it is some of the very last true coastal forest left in the south east of Madagascar and one of the most critically endangered in the country. The reserve is bounded to the east by the Indian Ocean and white sand beaches, to the west by winding fresh water rivers, and to the north & south by more protected forests. There is no village, there are no neighbours, and as the reserve has fresh water habitat, marine habitat, littoral forest, mangrove, wetland and open grasslands, you will find lemurs, birds, reptiles, mammals, sea turtles, crocodiles.... it's all here. 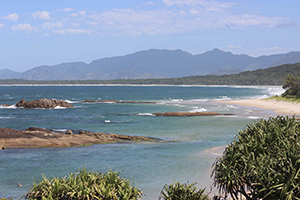 Overnight: Bush Camping at Lokaro (stunning palm-fringed beach with great swimming). After breakfast you head North through the mangroves and forest. The river is adjacent to the protected forest and wetland, which also incorporates many kilometres of stunning white beaches. 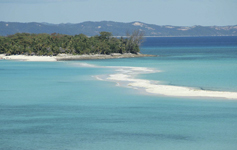 At 9.30am we head off for a 2 hour paddle, followed by a 20 minute walk to a secluded beach where we will enjoy lunch. Relax after lunch, enjoying this idyllic setting, before we set off at 3pm for the 2 hours kayaking to Belaveno. In the afternoon, after lunch, we have a 2 hour paddle to a large lake. Wander in the forest to see the fruit bats, before your night walk to spot Mouse, Dwarf and Wooly Lemurs in the forest. 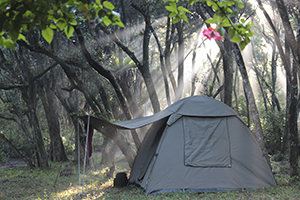 Overnight: Bush Camping in St Luce Reserve. Enjoy the location of your lodge in the afternoon, as the sun sets over the bay. Overnight: Manafiafy Beach and Rainforest Lodge (Private bungalows with ensuite bathroom, sundeck and separate access to the magnificent unspoilt beach). After breakfast you will embark on your choice of a wide range of wildlife and sporting activities which are included in your stay. Some of the options include: Kayaking in the mangroves, early morning boat trips for wetland birding, day and night walks in the rainforest to see five species of lemur, snorkelling in the bay and nearby cove, whale watching from the 15ft observation tower (June to December). Boat trips to the nearby islands for a secluded picnic lunch, walks along long empty beaches, visits to the local village and school. Optional activities, payable locally at the lodge include: massage treatments, whale watching boat trips (June to December), deep see fishing trips. Forest walks are the main reason for visiting this part of the island and those accessible from Manafiafy are "Littoral" rain forests – shady dense vegetation with a high degree of humidity and home to several Lemurs (collared brown, woolly, brown mouse, dwarf and sportive) as well as reptiles, spiders, birds, insects and orchids. Walks can be done at any time of the day and early evening, and are always accompanied by a Manafiafy guide. The rocks, islands and bays surrounding Manafiafy provide endless opportunities for exploring and within a short boat ride it is possible to find deserted beaches, scout for whales, or snorkel in the crystal clear water viewing corals and tropical 'aquarium' fish. 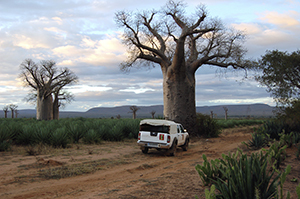 There is always something to do at Manafiafy and each excursion provides its own reward of new experiences – most of them unique to the island of Madagascar. 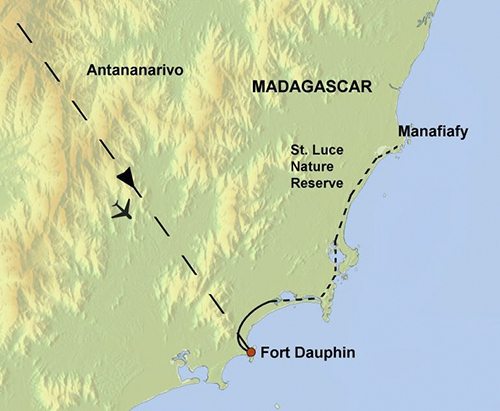 You will drive back to Fort Dauphin and continue to the airport for your scheduled flight to Antananarivo, for your last night in Madagascar. Upon arrival in Antananarivo (Madagascar's capital), you will be met and welcomed by an English speaking guide, before transferring to your hotel in the city centre and a farewell dinner! Meals: Breakfast and Dinner supplied. 2 Nights in Antananarivo at Pavillon de l’Emyrne on a bed and breakfast basis, 1 night in Fort Dauphin at the Kaleta Hotel, 3 nights bush camping and kayaking through the St. Luce Reserve an all-inclusive basis (activity, meals, soft drinks, beers, dome tents, stretcher beds, extra mattresses, lighting, bush showers & toilets), 4 nights at Manafiafy Lodge inclusive of activities, meals, local soft drinks and beers; All required transport in an air-conditioned vehicle in Antananarivo, and in 4x4 vehicles in all other locations; The services of an experienced professional Malagasy guide, all excursions, park fees and community or environmental levies. All kayaks, personal buoyancy aids and paddles are provided. International and domestic flights (Antananarivo – Fort Dauphin) and their taxes, Any excursions not mentioned in the program, all wine and spirits, laundry, visas and travel insurance, personal expenses and souvenirs. When arriving in Antananarivo in the morning of day 1 of the tour you will be picked up from the airport and embark on your tour. Should you arrive prior to day 1, pre-tour accommodation can be arranged and you will be picked up from your hotel on the morning of day 1 (Pick up time will be confirmed on arrival). In Antananarivo we use an air-conditioned vehicle, and for the rest of the tour, we use 4x4 vehicles. The city accommodation will be in up-market, boutique-style hotels, while the bush camping nights are spent in spacious 3 man tents that will include stretcher beds and mattresses with bedding. Bush style showers and toilets are provided, as well as all soft drinks and beers. Meals are a major highlight and prepared by French-trained chefs, both on the river and at Manafiafy, where the accommodation style has been selected for its barefoot luxury offering, quite unique to Madagascar. The Pavillion de L’Emyrne has just twelve rooms and is situated in the heart of the old town of Antananarivo. It was originally built as a private residence in the 1930s and is a delightful city guest house with its own garden. Rooms are air-conditioned and have satellite television. 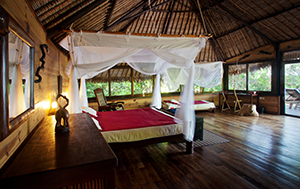 Manafiafy Beach and Rainforest Lodge contains only five private bungalows and offers an intriguing combination of rain forest lodge and barefoot luxury beach property all rolled into one. Each spacious en-suite bungalow is constructed out of local stone and mangrove poles under a palm thatched roof having its own sundeck and separate access to the magnificent unspoilt beach and ocean. 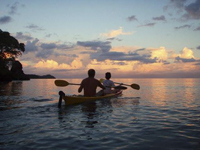 We provide Synergy Fluid Double Kayaks (which also have a centre seat and so can be paddled by one person if needed). They are stable and durable, being made from Polyethylene and they weigh only 33Kg. The kayaks are 3.8m long and 0.86m wide, with a carrying capacity of 190Kg. 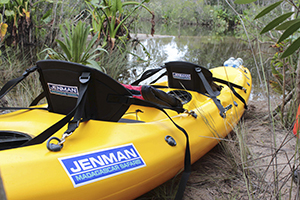 Each kayak has 2 hatches and contains one 15L "Dry Bag". There is also a tankwell with bungee cord if needed. Each kayak comes standard with a backrest on each seat( These are removable if desired). Your PDF (personal flotation device or "life jacket" is a handy 'one size fits all' and is a quality make and design. Cobra paddles with aluminium shaft and hard, durable plastic blades, complete the outfit. Antananarivo, better known in the short version Tana, is the bustling capital of Madagascar with about 2,000,000 inhabitants. Situated in the high plateau, the city was founded in 1610 by a Malagasy King. To protect the newly gained territory he left 1000 men behind and that'show Antananarivo got its name (town of 1000). It has developed to a quite interesting city with a lot of contrasts. 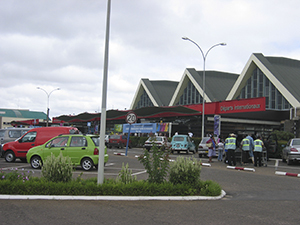 Thus that Tana habits the country's major international airport, most visitors will find themselves at least passing through the city. But you should spend some days here and explore the city, visit the market places and Roya. Roya is a palace and one of the main features of Tana. It is built on the highest hill and can be seen from for tens of kilometers in any direction. This typically laid-back Malagasy town is beautifully set on a small peninsula flanked by sweeping golden beaches and backed by high mountains with green hills, blue seas, fine beaches and a myriad of surrounding attractions, making it a popular destination. The port is hardly used and rusting old shipwrecks can be seen in the vicinity. Fort Dauphin is "the lobster capital" of Madagascar and the town boasts excellent restaurants specializing in seafood. The Manafiafy Forest (also known as Sainte Luce) is one of the last remaining stands of littoral forest in the country, and is home to one of the most critically endangered micro-habitats in the country (palms, birds and the rate brown collared lemur) . Located 40km from Fort Dauphin on a peninsula, this historical site contains some magnificent landscapes and beaches. Maniafiafy offers a wild, natural beauty. It is nested in the middle of filaos and coconut trees and is bordered to the East by splendid beaches of the Indian Ocean, and to the north & south by more protected forests. The Sainte Luce Private Reserve has been established to contribute to the conservation of this extraordinary habitat, and is part of 450 hectares of protected forest (including 26 hectares of primary forest), and wetlands, and also boasts kilometers of white-sand beaches. The western edge of the forest is surrounded by meandering sweet water crocodile habitat, and you will find various species of lemurs, chameleons, birds, reptiles, mammals, and sea turtles, thanks to littoral forest, mangrove and open grasslands. You can explore Sainte Luce during day and night walks or with long pirogue rides through the orchid-laden mangrove-lined rivers.